Back pain is a relatively common complaint characterized by a painful sensation in the patient's back that may be attributed to a number of conditions. Back pain may be caused by a number of factors affecting the muscles, bones, tendons, ligaments, and disks of the patient's spine. Strained muscles and ligaments may lead to back pain, particularly after heavy lifting or sudden awkward movements. Muscle spasms have also been known to cause back pain. In addition, certain structural problems may be involved. Bulging or ruptured disks, sciatica, arthritis, skeletal deformities, and osteoporosis have been known to contribute to back pain. In rare cases, back pain may result from serious conditions such as cauda equina syndrome, cancer in the spine, or infection of the spine. The symptoms of back pain typically vary in intensity and severity, ranging from mild to severe. Back pain presents with intense aches, soreness, and varying degrees of pain felt in the back region. A test is usually not necessary to diagnose back pain. However, a physician may perform some diagnostic tests to determine the cause or origins of the pain, as well as its severity. If a tumour, infection, fracture, or any other specific condition is suspected, a physician may recommend: x-rays, MRI or CT scans, bone scans, and nerve studies such as electromyography. 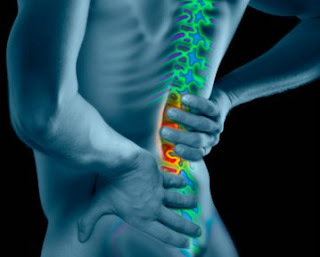 Most cases of back pain are resolved after a few weeks of home treatment and a period of rest. In more serious cases, however, some medications may be necessary. Additionally, physical therapy and exercise are integral parts of treatment. Very rarely, surgery may be recommended to correct the underlying structural anomalies that cause the pain.